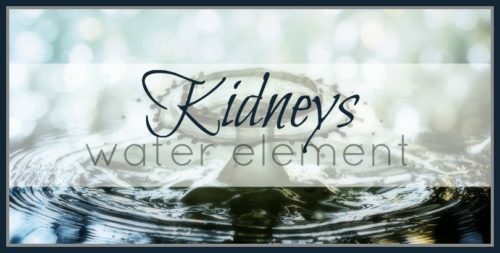 The Kidney Element in Chinese Medicine governs the Water Element and is associated with the season of Winter, where the energies are turning from the hotter yang months to the more cooling yin of winter. Each organ has an element associated with it: Liver & Wood, Stomach & Earth, Kidney & Water, for example. There is also an emotion, a color and flavor associated with each Organ system. For the Kidneys, the emotion is Fear (and the ability to Trust! ), the color is dark or black and the flavor is Salty. It also opens to the Ear, has the direction of north and is paired with the Bladder. The Kidney Element houses Willpower and manifests in the teeth and luster of the hair. Pre-Natal Jing is from your parents and can be likened to one’s basic Constitution and DNA. Post-Natal Jing is what is transformed from the food you eat and your lifestyle. You have more control overPost-Natal Jing health-wise. Ideally, there is a nice balance of Kidney Yin and Yang energies, but if there is Yin Deficiency, there will be symptoms such as heat, sweating, dryness, irritability, insomnia and low back pain. If there is Yang Deficiency there are more cold signs such as cold extremities, cold and painful lower back, increased urinary frequency, fatigue, premature greying, water retention and low libido. There can also be an emotional component manifesting as increased phobias and anxieties. Many of the above mentioned symptoms can be tied to the Thyroid function and Adrenal Fatigue in Western medicine. Eat warm: Foods that are beneficial to the Kidneys (in moderation) tend to be dark in color such as Black Beans, Sesame seeds, Seaweed(Nori, Kombu, Hiziki, Arame), Kelp, lamb and beef. Other beneficial warming foods include Ginger, Cinnamon, Miso soup, soybeans, Walnuts, chives and Goji berries. It’s best to see me, your Acupuncturist & Nutritionist, to get an idea of foods that are good for your particular constitution, as some of these foods can be harmful if taken in large amounts (kelp and seaweed, in particular). It’s also best to not eat too many cold, raw vegetables or cold smoothies. Also try to ingest food and drink at room temperature. There are wonderful Herbal Formulas to assist the Kidneys that I can include in your treatment plan. Next articleUZI BODNER: NEW ALBUM!